This really is a home with an attached garage. The possibilities are endless with this tri-axle beauty. Way up front is the Master suite with queen bed on it’s own slider. Mirrored Double wardrobe and two personalized closets as well. At the foot of the bed Is a useful dressing table under the window. 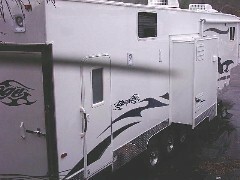 To the right is the lavy and next to that is the large water closet. Across the isle is the oversize shower.There’s plenty of room to move about. Downstairs is the main living area with Sofa Bed and Dinette sitting on a large slide. Above them is a wide ceiling window. Cooling is ducted with a large ceiling fan, too. For cooler regions, the forced air ducted furnace provides comfort. On the curb side Next to the door is an island kitchen with bar stools and flip-up counter extention. 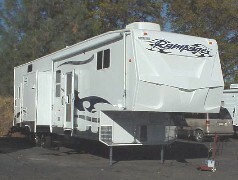 The Stove and Refer extend out on the third slider of this grand traveler. “But wait” – there’s a lot more. Inside and over the garage is a nice bunk for two complete with windows. This unit sleeps 10! 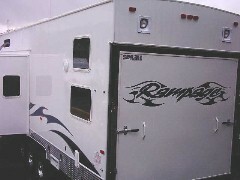 Out back is the fully enclosed cargo area with cabinets, removable carpet and a magic electrically lowered bunk. Extra access is through the full-size side door. There are windows and vents for safe and versatile accommodation of people and toys. 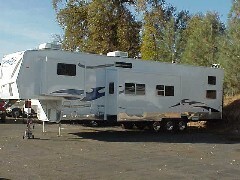 Outside is a whole ‘nother story with 18’ awning, roof ladder; fuel station and 5500KW Generator with two fuel tanks. Diamond plate surrounds this unit. Chrome wheels. And storage up front. Hook up and go – now! It truly is a beauty - and amazingly functional, too! Two 30# LPG tanks (filled). Or, custom order your's today and save as much as ten thousand dollars!